The new standard of Leslies.........2101top and 2202 bottom,Real top rotor horn, Louder than any 147 or 122. 150 watts top and 400 for the bottom. simulater low rotor dopler. stereo outs for daisy chains. motion pro 144. Top 40 watt horn totor 80 watt bass rotor. 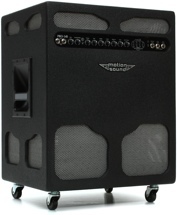 The 40watt top can be purchsed separatly as well has the low pro horn cabinet only maybe. 2 speed with brake. these Cordovox anp leslies are still around and sound great. They utiise a low rotor 2 speed. The there is a few Fender vibratones left. They are pricy as collectors itams, I recently played a Ric 12 through one on the choral speed ...........ahhhhhhhhhh Bass rotor 2 speed , no brake. The vibratone is the only lesslie that doesn't use a amp. Jutst plug it in your extensin jack and used the crossove supplied. For the price of a pristine Fender vibe you can have the Leslie 1201 top. On a side note I wonder what a biamped or triamped system with a frequency analyzer in the signal chain that would spin the speaker at the same frequency (or a harmonic there of) of the primary notes fundamental frequency? Thinking about that kinda makes my head spin without the beer. I duuno 'bout all that Scoot but I do think they call those things Synthesizers! On a more realistic note I have been reading the Midi control manual of my Leslie 2101 and sure enough the mechanical rotation speed can be controlled by frequency as well as the spin up/down speed and brake. (by it's own footswitch , My Hammond XM-1, or even a midi sequence . Also different Leslie cabinet resonance models can be set by midi control changes. The spin direction can also be controlled and reversed by midi. (a very strange effect) Talk about making your head spin. Truly this model is the Leslie of the 21'st century , a meld of the old and the new. WOW thats pretty cool and probably more usefull than my idea although you could combine both and set the MIDI changes to match spin frequency with fundamental frequencies.... probably would not amount to much with the tonal frequency and the rotational one but the idea just popped into my head. Yeah , thant's kinda my line of thinking too. Similar to timing effects to a beat , like auto panning , delays or synth vca/vco stuff.